There was a character called 'Seedy Boss'. Ricky invented him in the many spare hours whilst working at Xfm with Stephen Merchant back in the late nineties. 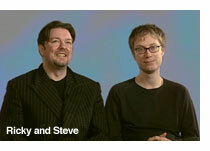 Steve went on to work at the BBC and did a course for trainee TV producers. A practical element of the course was to produce a piece of work from a one-day video shoot. So Ricky and Steve got together to write and film a short documentary about the delusional and inadequate boss who they christened David Brent. The Office Mk I was filmed where Ricky used to work at the University of London Union on a Monday in June when the senior staff were away. 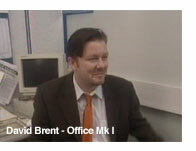 The office space had recently been done up in a generic open-plan style making a suitably anonymous backdrop for Brent's pontifications. No one at work in the offices seemed to notice the camera crew, lights and Ricky laughing his head off. After it had been edited and put onto video tape it became apparent that people 'in the industry' were passing copies around amongst themselves and there was a decided buzz building around the then unknown Ricky Gervais. Well over a year after the demo was made the BBC decided they'd like to see whether it would work as a proper series. They got in touch with Ricky and Steve who insisted that they would have to direct the programme as well as write it and, in Ricky's case, act in it. The BBC agreed and asked for a script and then a pilot episode to be made. After chosing the cast, the pilot was filmed in an unused suite of offices at Teddington Studios. Initially, the idea was to make the pilot the first of six episodes and so its plot is basically the same as the series proper, but after editing Ricky and Steve became nervous about the style of the result. They were concerned that it seemed too well constructed and to a certain extent exploded the myth that this was supposed to be a fly-on-the-wall documentary. They reworked the script and refined their directorial approach before persuading the BBC to remake the pilot along with the rest of the series, which had by now been given the green light. Six weeks of filming and a further seven weeks editing resulted in The Office going on-air for the first time in the summer of 2001. The viewing figures, whilst fine for BBC2 at that time of year, weren't spectacular. Importantly though, the show was popular with the critics and was 'pick of the day' in quite a few newspapers during the first run. 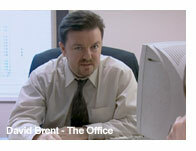 Press articles with even the most tenuous connection to office life began to be illustrated by now familiar stock shots of David Brent grinning smugly from behind his desk. Then Welsh pop-combo, the Stereophonics released a version of 'Handbags and Gladrags' (the tune over the credits in The Office). 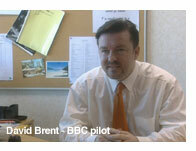 BBC2 repeated the series and got lots more viewers and The Office was fast becoming a bit of a hit. 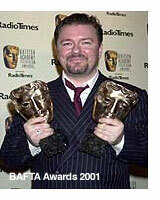 When the awards season came round early in 2002, The Office made a clean sweep at BAFTA recognising the impact of the series as a whole and Ricky's performance in particular. Lots more awards followed as did a second series and a very final two-part Christmas Special. From these simple beginnings The Office has been watched by millions in over 60 countries, sold millions of DVDs and videos and garnered some 20-odd awards and hopefully inspired at least one person to stop wasting their life doing a job they don't enjoy.